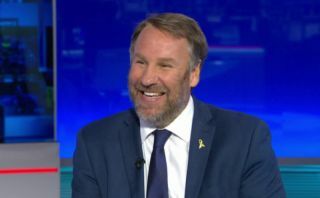 Pundit Paul Merson took to Twitter to hilariously toll Liverpool star Mohamed Salah after today’s 0-0 draw against Manchester United at Old Trafford. The Egypt international just couldn’t get into the game, with Luke Shaw having the better of him pretty much throughout the match. This is not what we’re used to seeing from Salah, who was sensational for Liverpool last season, scoring 44 goals in all competitions to pick up the Golden Boot and PFA Player of the Year prizes. I don’t know how @LukeShaw23 was getting around the pitch so well with @MoSalah in his pocket ? This is a big worry for Jurgen Klopp as his side are really faltering in their bid to win the Premier League title this season. Having looked favourites for so long, the Reds have dropped a lot of points recently, with Salah also scoring just once in the team’s last five games in all competitions. Shaw can be pleased with his performance, but it’s not good enough from Salah at such an important time for LFC.